Is Tokyo Ghoul:re different from the original Tokyo Ghoul? Tokyo Ghoul:re is the sequel manga to Tokyo Ghoul. The Tokyo Ghoul manga ended in September of 2014 and was adapted into the first 2 seasons of the anime, though the second season, Root A, greatly diverged from the manga with significant differences but still attempted to have the same major events as the manga. You can read about possibilities of why they did so in this question (be wary of spoilers in all the links here): Why did Tokyo Ghoul √A completely deviate from the manga? and for more details on the differences, you can read my answer or this post on reddit asking about the same thing. Tokyo Ghoul:re picked up 2 years after the events that ended Tokyo Ghoul. It's about Hiase Sasaki, a ghoul investigator and leader of the Q's squad, currently low ranking investigators that underwent a very special surgery. It follows Hiase, his squad, and his superior/supervisor Akira Mado (daughter of the investigator that was Amon's superior and partner investigator in the beginning of the series), and shortly after all that begins expanding on stuff from the original manga, as well as filling in the 2-year gap. Tokyo Ghoul:re is the continuation of Tokyo Ghoul. If we follow the original age of Kaneki (in the first chapter of the manga it labels him as 18, but somehow we all decided that he was 20 at the end of the manga), then it should have picked up 3 years later, seeing as he is 21 or 22. Which it does. A lot of people say that it picked up 2 years later, because Kaneki's new personality, Haise, has been an investigator for 2 years, but if you read it all the way through, Kaneki spent about a year in Cochelea before becoming Haise. Tokyo Ghoul:re is supposed to be what happens next, but we aren't sure if it will be in the anime, as season 3 has not been released yet. What are the differences between the Tokyo Ghoul anime and manga? Will Mr. Mado return in Tokyo Ghoul Re? Is the anime of “Tokyo Ghoul:re” (season 3) canon? 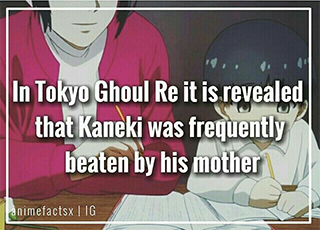 What happened to Kaneki in episode 12 of Tokyo Ghoul:re?